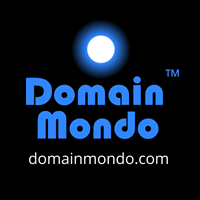 Domain Mondo's weekly internet domain news review (NR 2017-09-17) with analysis and opinion: Features • 1) Internet Grew to 332 Million Domain Names in Q2 2017, But ICANN New gTLDs Declining, 2) ICANN news, 3) Names, Domains & Trademarks News, 4) ICYMI Internet Domain News, 5) Most Read Posts. .COM and .NET registry operator Verisign.com reported this week that globally, the internet grew to 331.9 million domain name registrations as of June 30, 2017 (end of Q2 2017), an increase of approximately 1.3 million registrations in Q2 2017, a growth rate of 0.4 percent over Q1 2017, and an increase in domain name registrations of 6.7 million, or 2.1 percent, year over year. At the end of Q2 (June 30, 2017), the .COM domain name base totaled 129.2 million domain name registrations, an increase from Q1's 128.4 million, while the .NET domain name base totaled 15.1 million domain name registrations, a less than 1% decrease from Q1's 15.2 million (pdf). .NET registrations have slowly been declining since 2016, a trend likely to continue since global monopolies ICANN and Verisign seem intent on continuing their price-gouging of .NET consumers (registrants) worldwide. New .COM and .NET domain name registrations together totaled 9.2 million in Q2 2017 vs. 8.6 million in Q2 2016. Unlike .NET domains, .COM wholesale prices are presently capped and controlled by the U.S. Department of Commerce (NTIA). The U.S. Department of Justice Antitrust Division is currently investigating ICANN and Verisign. As of June 30, 2017, there were 302 ccTLDs (country-code top-level domains) delegated in the internet root, including Internationalized Domain Names (IDNs), with the top 10 ccTLDs comprising 64.8 percent of all ccTLD domain name registrations. 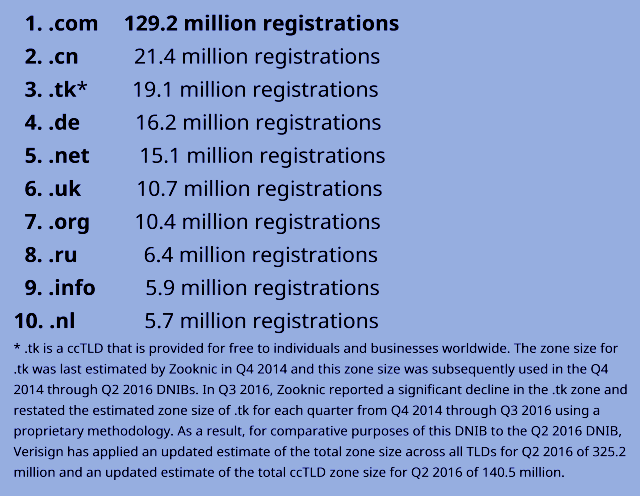 Total ccTLD domain name registrations were approximately 144.2 million, a 0.8 percent increase over the first quarter of 2017, and a 2.6 percent increase year over year. Editor's note: "other gTLDs" include ICANN's new gTLDs which were launched starting in 2014, and many are already referred to as "garbage extensions" by astute domain name registrants worldwide. Obviously, ICANN and its "ICANN community" of lobbyists and "special interests," as well as most new gTLD registry applicants and operators, are clueless about what consumers (registrants) really want and need. Hardly surprising since most domain name registrants are excluded, by design, from ICANN policy-making structures. 23 September 12:00 – 13:00 UTC (time convert) 8am EDT (US): Public Board Meeting: Agenda | Regular Meeting of the ICANN Board | ICANN.org 23 Sep 2017. The sessions will be in English only. The format for each will be a listen-only session via Adobe Connect: https://participate.icann.org/opencommunity/. Additional access numbers and participant codes here. More information: here. • ICANN 'Last Resort' Auction Proceeds CCWG Newsletter | August 2017 (pdf):"The CCWG will NOT make any recommendations or determinations with regards to specific funding decisions (i.e. which specific organizations or projects are to be funded or not)." • EU GDPR: Data Protection and Privacy: Progress Update and Next Steps | ICANN.org: "... an update on our data protection and privacy work as it relates to the European Union's General Data Protection Regulation (GDPR) ... We have now consolidated the information that was collected into a more easily readable format [PDF, 686 KB]. A high-level summary is also included in the document. We encourage you to review the submissions, and the summary ..."
Annexes I to K, 12 Sep 2017: reconsideration-17-2-dotmusic-requestor-annexes-i-redacted-12sep17-en.pdf [1.15 MB]. Trouble in paradise? Uniregistry staff departures continue! | OnlineDomain.com. • Harvey and Irma scams: "Real websites for first responders, insurance companies, construction, medical and other vital organizations in the Florida and Texas areas — are being targeted by these malicious spoofed domain registrations."--circleid.com. • "Phishing scams seem to be getting more common and more sophisticated"--Fighting Phishing with Domain Name Disputes | circleid.com. • DNS vulnerability: What would happen if the DNS, the ‘phone book’ of the internet, were compromised? | MarketWatch.com: "... one crucial part of the internet’s infrastructure, the Domain Name System (DNS), isn’t diverse ... As applied to DNS, diversity means making sure these mission-critical services aren’t all the same type ..."
• Booking.com Trademark: Booking it to the District Court | Dorsey & Whitney LLP | JDSupra.com: "This case is unusual because the trademark applicant, Booking.com, B.V., did not appeal the refusal decision to the Court of Appeals for the Federal Circuit, but instead filed a civil suit against the Director of the U.S. Patent and Trademark Office. This allowed the Virginia federal court to review the record de novo and as the finder of fact ..."
• Internet Shutdowns in India: Govt issues first-ever rules to carry out internet shutdowns in India | HindustanTimes.com: "India has shut down the internet more than 40 times in 2017. The government has now come out with rules to order such blackouts." See also: India issues sweeping rule on internet shutdowns--CPJ.org. • Internet Tax: Doomed plan to tax online retailers | RStreet.org: "Gov. Charlie Baker wants Massachusetts to join a handful of other states in a doomed effort to pass an extraterritorial taxing scheme that the U.S. Supreme Court has already declared unconstitutional."